FEEDBACK: A MUSIC CONFERENCE FOR YOUNG PEOPLE – SPEAKERS & PANELS REVEALED! Indent, the peak network for all ages entertainment in NSW, in proud collaboration with Vivid Sydney, is thrilled to announce the return of FEEDBACK, our annual music conference for young people. Following hugely successful conferences in 2013 and 2014, FEEDBACK aims to assist young people in getting a leg up in the highly competitive music business. Held at Sydney’s iconic Museum of Contemporary Art on Monday 8th June (Queen’s birthday long weekend), FEEDBACK will be a jam-packed day of music industry guest speakers, interactive sessions, take-home resources and networking opportunities, tailored towards 12-25 year olds. FEEDBACK’s leading industry speakers will offer helpful advice and entertaining anecdotes to young musicians, aspiring industry professionals and music fanatics alike. If you are looking to forge a career in the music industry, FEEDBACK will bring you real-life examples on how to succeed from a young age, plus advice on how to navigate the roadblocks faced by youth in today’s music industry climate. Pioneering electronic act The Presets remain one of the most respected bands in Australia. Since the early 2000’s university buddies Julian Hamilton and Kim Moyes have been producing their idiosyncratic, techno-influenced style for a growing audience of dance and pop fans alike. With radio bangers like Promises, My People and Are You The One? they became the first dance act to win Album Of The Year for their second LP Apocalypso at the 2008 ARIA Music Awards. They’ve supported Daft Punk, won ‘Songwriter Of The Year’ at the APRA Awards, and impressed the world with their live shows. Host of triple j’s ‘Home and Hosed’ Dom Alessio will be facilitating the discussion. Over the past 15 years Sydney singer-songwriter Andy Bull has carved a successful music career in the alt-pop scene as both a songwriter and producer. 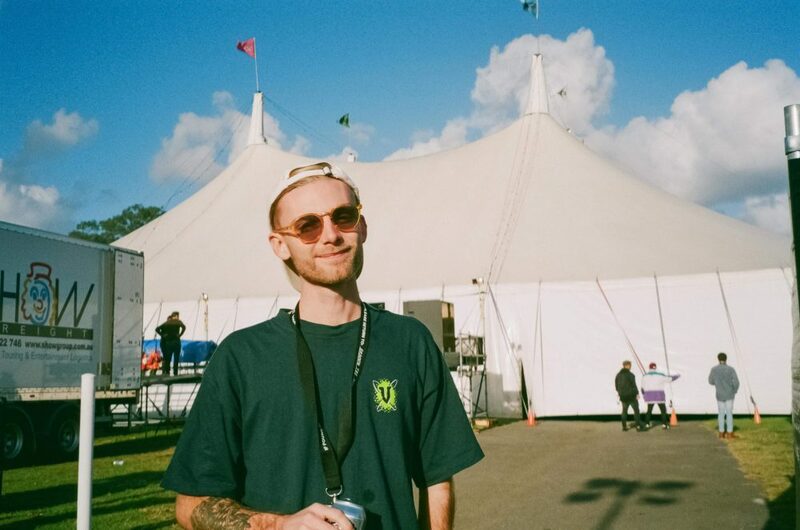 From the brooding electro of his single Keep on Running to the classic pop melodies of his triple j follow up Talk Too Much, there’s no doubt Bull knows how to write a killer tune. Bull is a modern day Renaissance man – he wrote, produced and performed almost everything on his 2014 LP Sea of Approval, and will be sharing his songwriting tips with facilitator (and Bluejuice frontman) Jake Stone, as well as his creative processes, how he redefined his musical identity and reached commercial success. With the majority of electronic gigs happening in either nightclubs or at 18+ music festivals, this panel will turn the spotlight on a genre that has struggled to establish itself in an all-ages capacity. What sorts of opportunities and roadblocks exist within the Australian electronic music scene? How do young and emerging producers, DJs and promotors stand out from the crowd and secure a gig? We speak to some electronic music aficionados like Dan Williams (Art Vs Science), KLP (DJ), Bad Ezzy (FBi Click/DJ), Alastair Green (MAKER Agency), Andy Garvey (“Spin the Bottle” DJ, FBi Radio) and Black Summer, who kickstarted their careers in the scene at a ripe young age. Goodgod Small Club booker and Two Thousand editor Andrew Levins will be facilitating the discussion. How do bands and artists measure success in the new digital age? Are we living in a time where an artist’s popularity is measured by Facebook likes instead of record sales? 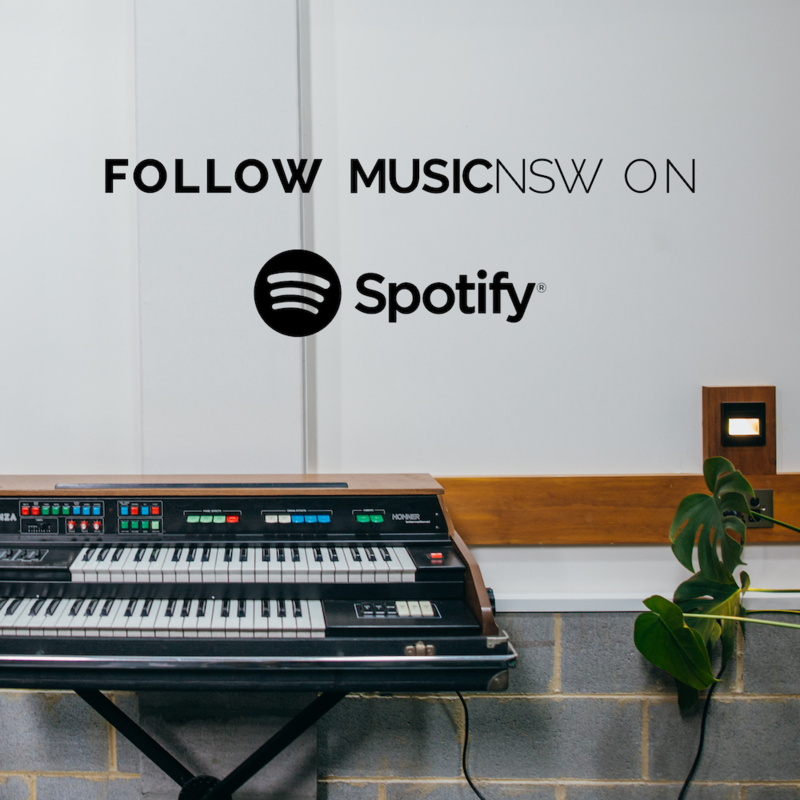 Thanks to YouTube, social media, music blogs and other streaming services, bands are catapulting to the forefront of the Australian music industry at ferocious speeds. How has the music industry changed? How do bands and artists stay relevant and establish longevity? 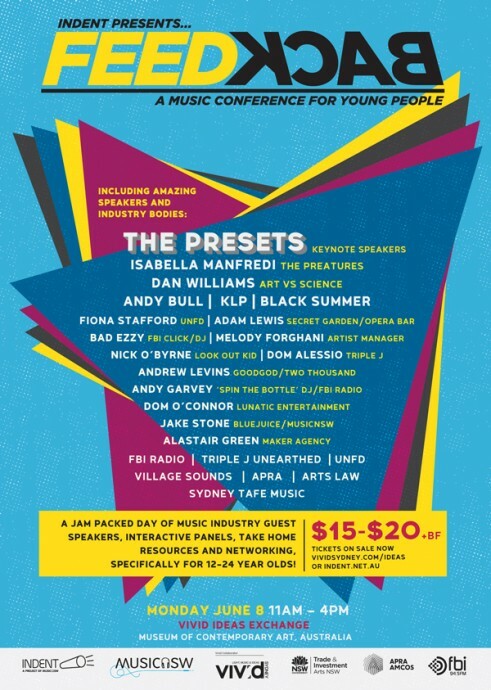 We will hear from a revered panel of industry professionals including Isabella Manfredi (The Preatures), Adam Lewis (Secret Garden/Opera Bar), Nick O’Byrne (Look Out Kid), Fiona Stafford (UNFD) and Melody Forgani. This panel will be facilitated by Dom O’Connor (FBi Radio). Don’t be nervous! This industry speed-dating session doesn’t involve revealing your horoscope or favourite colour. Instead, it’s a chance to ask leading music industry service providers some questions about who they are, what they do, and how you can access their services. We’ll have APRA AMCOS talking about royalties, FBi Radio and triple j Unearthed talking about how to get played on radio, publicity tips and tricks from UNFD, legal advice from Arts Law, booking advice fromVillage Sounds, and educational tips from Sydney TAFE Music. Any questions? Fire away! WHERE: Vivid Ideas Exchange, Museum Of Contemporary Art, 140 George St, Sydney. PRICE: Tickets are on sale now for just $15-$20+BF available HERE. Indent is a project of MusicNSW and funded through ArtsNSW. FEEDBACK is proudly supported by APRA and FBi Radio.